In gate level simulation (GLS), one of the hard task is 'X' propagation debug. This use case shows how to turn Gates On the Fly and other ordinary waveform display into a powerful 'X' source debug tool. The solution is to integrate waveform tool like QuestaSim or Verdi and Gates On the Fly by TCP/IP link. 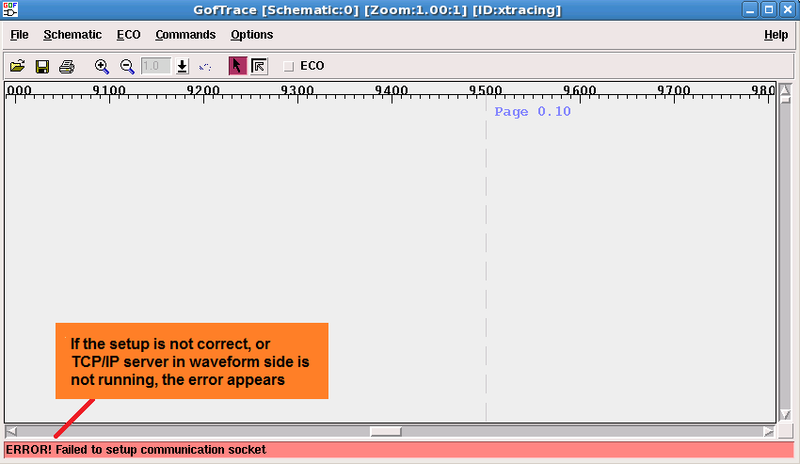 The waveform tool works as a server and GOF connects as a client, as shown on Figure 1. 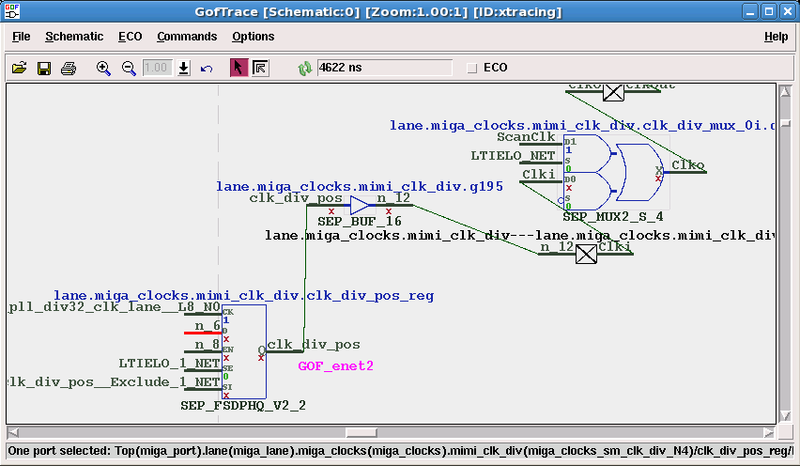 When GOF is expanding an incremental schematic, the signals values are transfered from the server and displayed on the schematic. User can decide how to trace the 'X' source accordingly. Or use X-tracing command to show the root cause of 'X' directly. The current version V4.3 of GOF supports two waveform tools, QuestaSim and Verdi. If the waveform tool is QuestaSim, bring up QuestaSim waveform by 'vsim -view vsim.wlf'. Enable Transcript window by menu View->Transcript. Run TCL server script in Transcript window. The TCL script is in GOF release, "GOF/examples/x_tracing/wave_server.tcl". After the script is run, QuestaSim is in a server state waiting for GOF to connect back as a client. 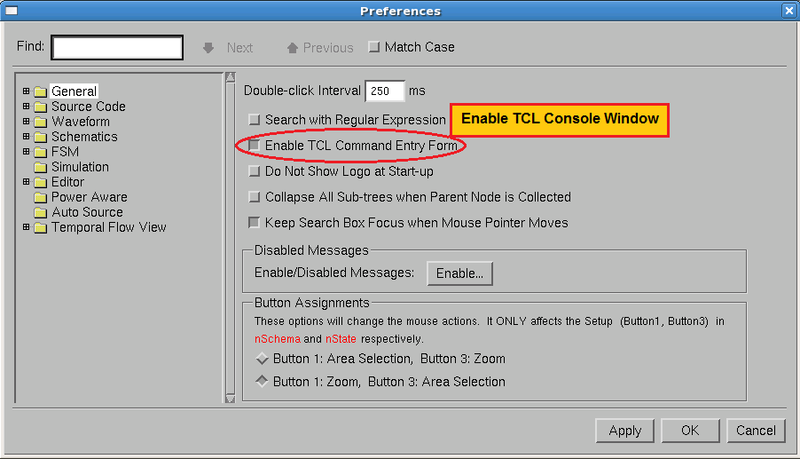 If the waveform tool is Verdi, check 'Enable TCL Command Entry Form' in Verdi Preferences window. 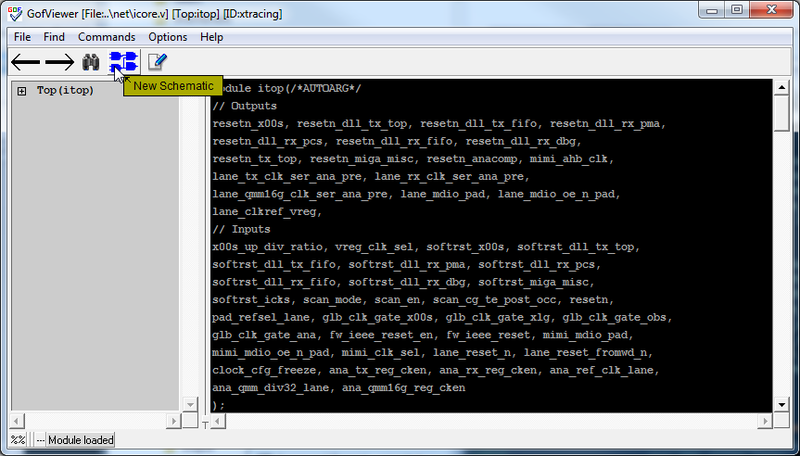 In Verdi TCL console, Command Entry window, run "GOF/examples/x_tracing/wave_server.tcl". Note: The default TCP/IP port number is 5100, and it can be adjusted as needed. 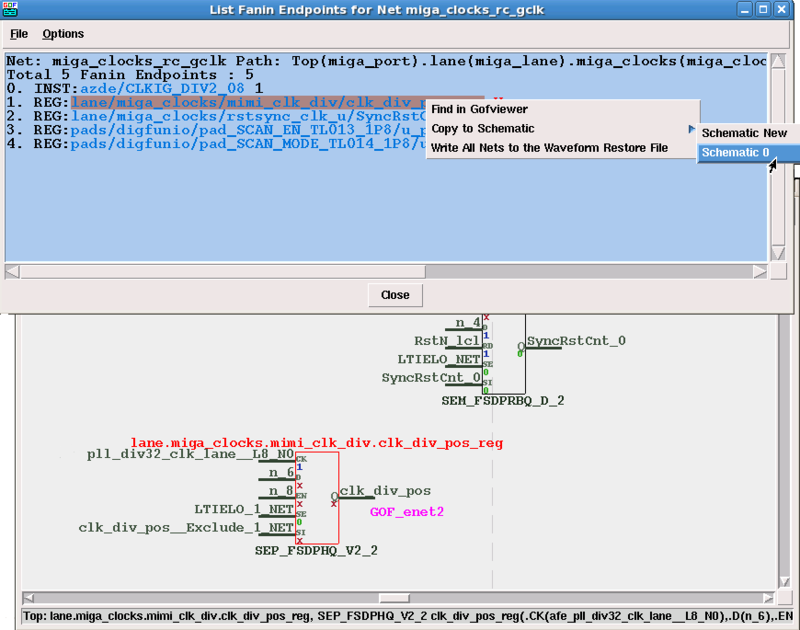 In client side, bring up GOF by command line, 'gof -lib tsmc40nm.lib netlist.v'. It's highly recommended to use liberty .lib files for library cells instead of verilog library files. When GofViewer window is up, click 'New Schematic' to launch schematic window. 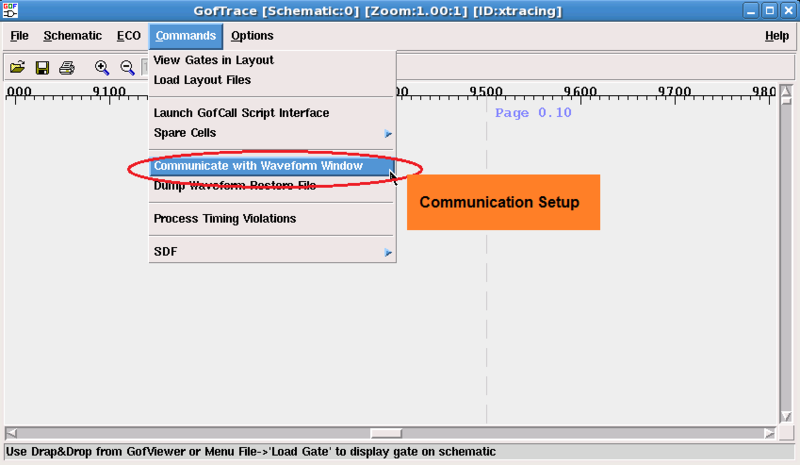 In schematic window, GofTrace, use menu Commands->'Communicate with Waveform Window' to launch communication setup window. To setup TCP/IP link with waveform tool correctly, these 5 items should be configured. Check 'Enable Communication' box to enable TCP/IP link with waveform window. If the configuration is good, 'Successfully Connecting to Waveform Window' message appears at the left bottom corner. Time refresh button and current time indicator are displayed on menu bar. If something goes wrong, error message 'ERROR! Failed to setup communication socket' appears at the left bottom corner. The cause can be either server not running or the client configuration being not correct. Now it's time to debug the gate level simulation result. Use ctrl-g to load a gate that is under investigation. The pins of the gate have waveform values annotated which can be '1', '0', 'X', 'Z' or transition format like falling edge '1-0'. If a pin can't be found in waveform database, it is annotated as 'NA'. User can click mouse-left-button on a pin annotated with 'X', and click mouse-right-button to pop up menu and choose 'X-source tracing' command. 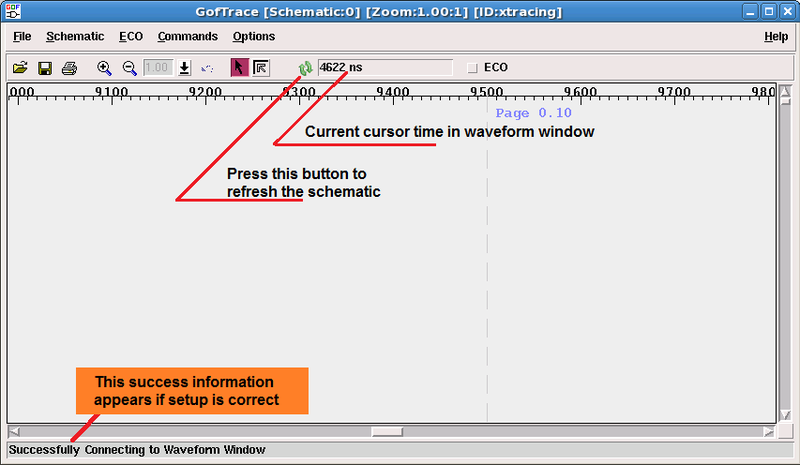 User can do 'Send Selected Nets to Waveform' command to display the signal on the waveform window. A text window pops up with endpoints listed and the current values are also listed on the window. The endpoints with value 'X' are the root causes of that 'X' signal. The 'X' source endpoints can be send back to the schematic for further analysis. 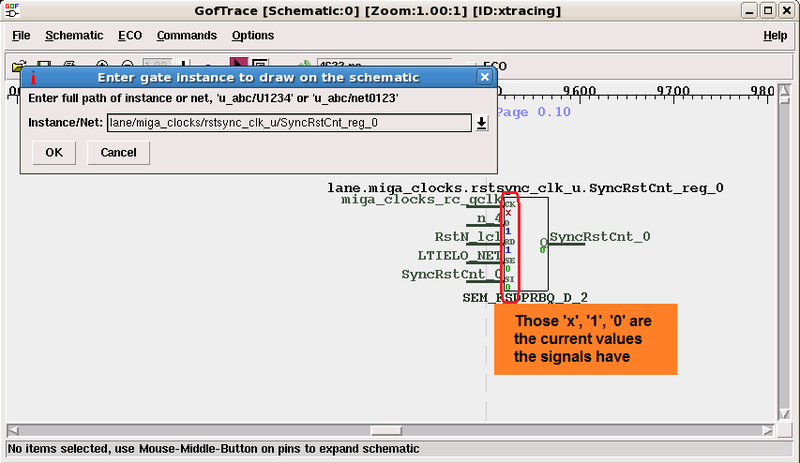 User can do more 'X-source tracing' on 'X' pins, or use mouse-middle-button on 'X' pins to expand the schematic. Using mouse-middle-button to click on 'X' pins, user can control how the schematic is drawn. 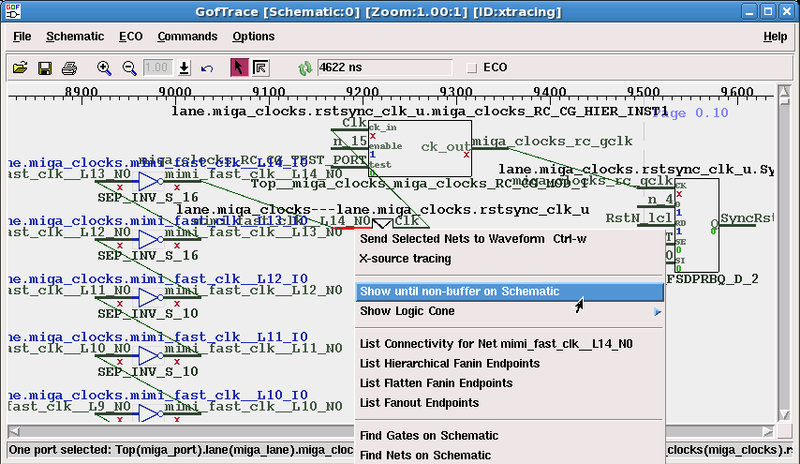 When a signal is driven by chain of buffers, like clock signal, 'Show until non-buffer on Schematic' command can be used to speed up the buffer tree tracing. 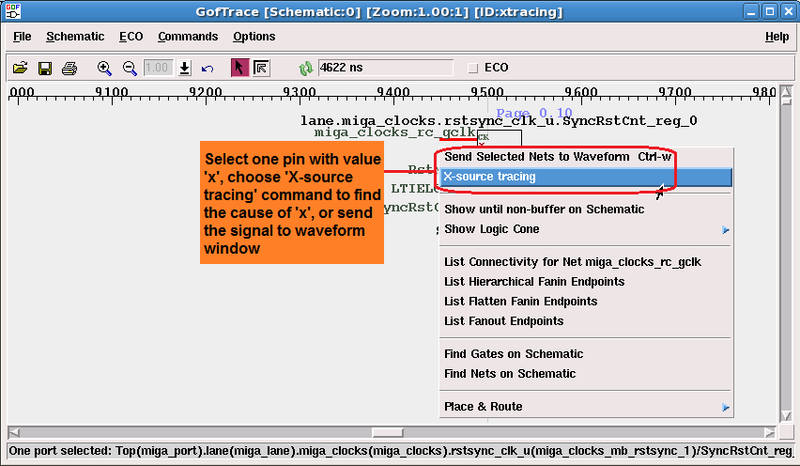 By following the 'X' pins, the schematic can get to the point of 'X' source, like the result in 'X-source tracing' command. 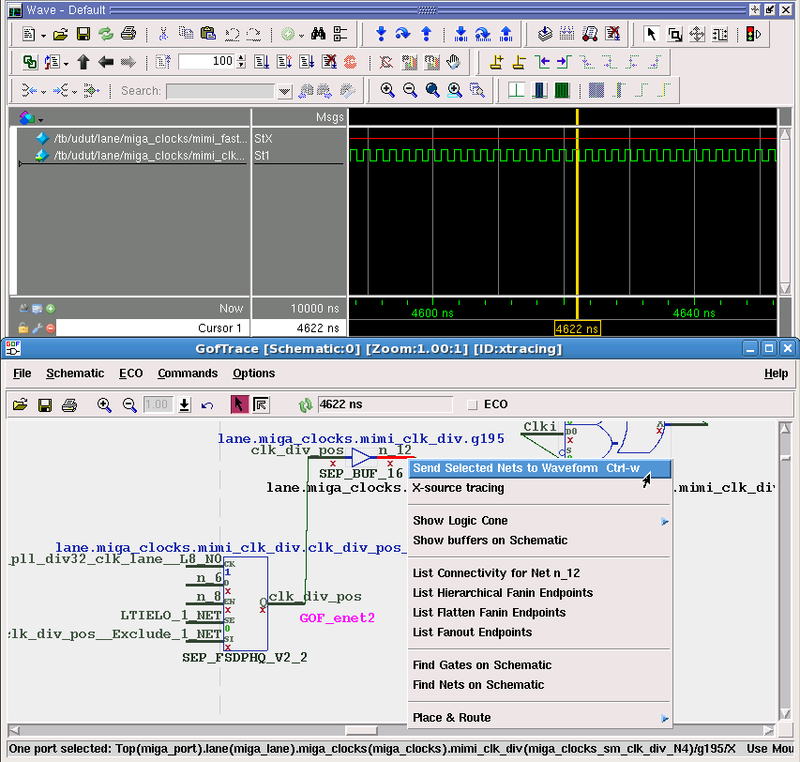 Combining waveform tool with GOF, the partial schematic feature of GOF can be turned into a powerful 'X' debugging tool. It greatly increase the 'X' propagation debug efficiency.